Perhaps more so than any other profession or hobby in the world, sailing has a specialized language that is essential to understanding its particulars. Some of sailing language is cultural, with different names given to universally recognized objects or events, but much of it has to do with sailing technologies that exist in no other context. This glossary covers the basic parts of a sailboat and some sailing maneuvers. Before you step on board your boat, it is always a good idea to know what is around you. Without knowing the parts of a boat, it is difficult to work with a crew or maneuver properly. Read on, and get ready to get out on the water! Fore and Aft — We have covered bow and stern before, but fore and aft are also important directional terms that every sailor should know. An easy way to remember them is to think of "fore" as similar to "forward" and "aft" as similar to "back." Port and Starboard — While on the helm of the boat looking forward, port is the left side and starboard is the right side. Just as you would never say rope when you mean line, or back when you mean stern, never say left or right when you mean port or starboard. If you are having trouble remembering which is which, just remember that "left" and "port" both have four letters. Windward and Leeward — The terms windward and leeward can continually change; they are relative to the boat’s forward motion through the wind. The side that the wind hits first or from which the wind is coming is the windward side. The wind leaves, or blows to, the leeward side. When you are "heeling," the high side of the boat is the windward side. Tacking — Tacking is one of the means of changing direction on a sailboat. 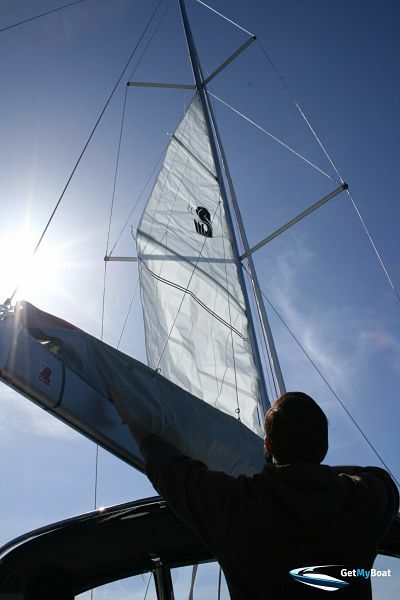 When you tack, you move your boat's bow through the wind, so the sail luffs and then fills as the wind switches sides. If you spend too much time on your tack, you will lose much of your speed, so it is best to move through the wind as quickly as possible. Jibing — A jibe is the counterpart to a tack. Instead of moving the bow through the wind, you move the stern through the wind. Jibing is done downwind, and because the wind is directly behind you, be aware of the boom: it will switch sides very quickly. Transom — The transom is the piece of the boat that forms its stern. This is where you will most likely see a boat's name and her home port. Mast — The mast is the vertical portion of a sailboat's rigging. On a single-masted sailboat, this is where both the jib and the mainsail will be rigged. Boom — The boom is the horizontal portion of a sailboat's rig, fixed to the mast at a 90-degree angle. Though the name comes from a Dutch word meaning "pole," the boom can also live up to its other meaning and cause sailors serious injury, even death. Watch out for the boom when tacking and jibing. Sailing directly downwind is an especial point of caution, as the boom can swing over without warning if you do not pay careful attention to how your boat feels and how you are steering. Jib — The jib is the large triangular sail that sits forward of the mast and is rigged on the forestay. Mainsail — The mainsail is the triangular sail that is rigged to the boom and mast. Spinnaker — Most sails that you will see on the water are white, with the exception of spinnakers. Spinnakers are the large, brightly colored sails that fly in front of the jib, and are used to catch more air when sailing downwind. Setting the spinnaker can often be quite the task, as it involves a crew member climbing out on the foredeck and attaching the spinnaker pole to the mast and windward edge of the sail. Stays — Stays help to balance the mast and keep it in its proper place. On single-masted sailboats, the forestay runs from the top of the mast to the bow, and the backstay from the top of the mast to the stern. Shrouds — Shrouds run from the top of the mast down to the port and starboard sides of the boat. Much of the time they are held out further by small beams called spreaders. Along with the stays, they stabilize the boat's rig, and shrouds also help the mast keep its shape. Halyard — A halyard is a line that is used to raise and lower sails. 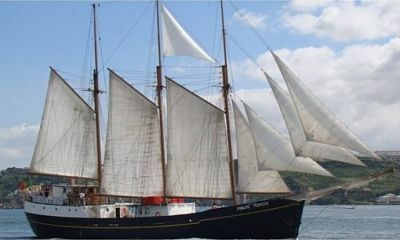 The mainsail halyard is most often run along the mast. Sheet — A sheet is a line that is used to either take in or let out a sail. On a sloop rig, sheets are typically attached to the clew, which is the aft corner of a triangular sail. The main sheet, which is typically attached to the boom, is in constant use, and all sheets are continuously adjusted. These are some of sailing's basic terminologies. Once you have these under your belt, you will have the essential parts of a boat down, and you will be ready to move on to more advanced topics. Happy sailing!